Inside a meeting of the Episcopal Church in Malakal, taken during the visit of the Archbishop of Canterbury, Dr Rowan Williams. Morton, Chris. 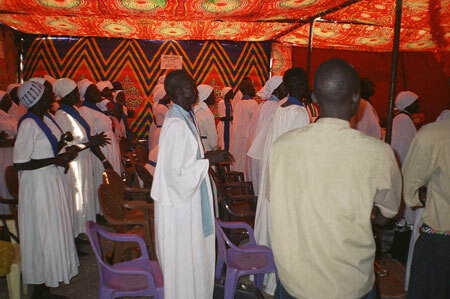 "Episcopal Church in Malakal" Southern Sudan Project (in development). 03 Jan. 2006. Pitt Rivers Museum. <http://southernsudan.prm.ox.ac.uk/details/2007.137.29/>.